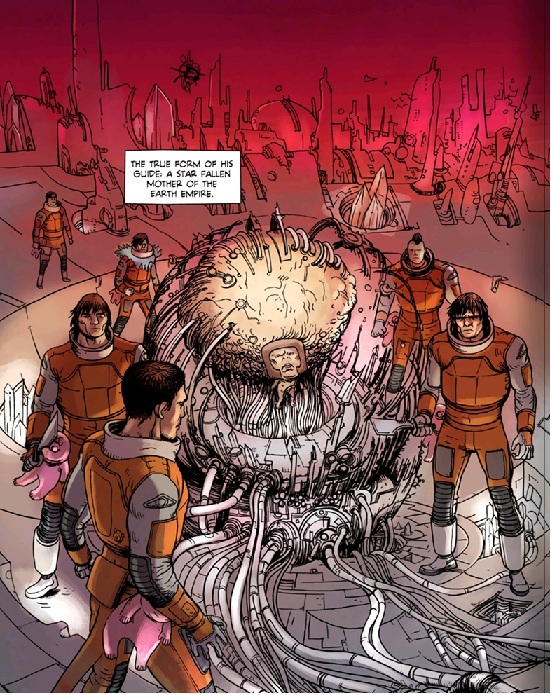 When we finished what I think could be called the first cycle of stories within the newly imagined “Prophet” last issue we discovered that there were many many clones of John Prophet waking up on many many worlds. As best as can be recalled, the goal of the John Prophets is to restore the empire of man. But what we’re not sure about is whether its a just and kind empire or just another competing evil empire full of dictators and evil doers. The future seems to be quite savage. Same as it ever was I guess. 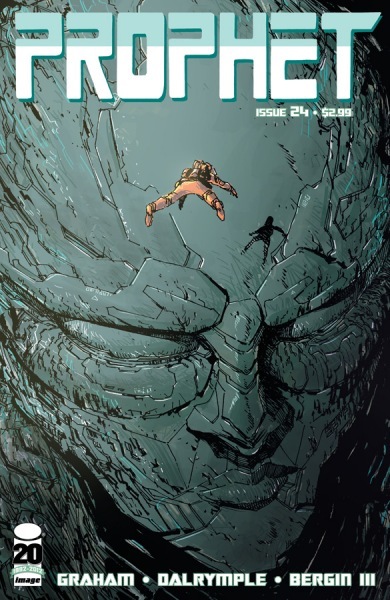 This issue takes us to a vast ship with human features inspired by the architecture of both Giger and Druillet. The book just drips with homages to Heavy Metal. This particular John Prophet has a tail. But each Prophet would also seem to have a different set of tools based on the world that they’re “hatched” from out of stasis. 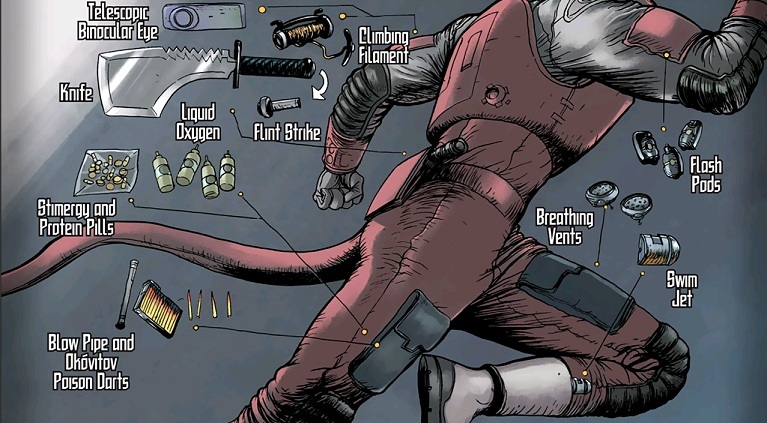 Here’s the writer’s signature move describing all the cool tools. I should mention that this John Prophet knows how to use that tail. I’m not entirely certain what “Swim Jets” do (help in swimming?) or “flash pods” but I do know that they look cool and these Prophets look prepared. The ship that this particular ark has crashed in features many other John Prophets. This story brings us to a sad and ghostly little girl who appears to be a holographic projection. I’m beginning to think that a decent science fiction writer can turn all the old tools of horror into something reasoned and viable. This particular Prophet finds himself in a bit of trouble as he’s slowly being poisoned by the toxic environment and is being hunted by another of his brothers who looks to have already lost his mind. He almost dies until he reaches some kind of restoration chamber which looks like this. Well of course he awakens with the “Protective Star Skin”, which looks to be a nan manufactured bubble suit of shocking pinkness. I admire the textual imagination of this particular far future. There is a saying by the late great Arthur C. Clarke that advanced technology would be indistinguishable from magic. The world of Prophet feels to me like some dangerous lethal cartoon. Here’s the final scene in case you were wondering what he’s floating toward. It looks like there are many Prophets with many manufactured synthetic computers around their waists and necks. Can’t quite tell if they all have tails. Bottom line: yet another sensational issue. The whole thing feels like space opera with the details designed by Rudy Rucker. 4.7 out of 5 stars. Someone should win an award for the artwork and design.